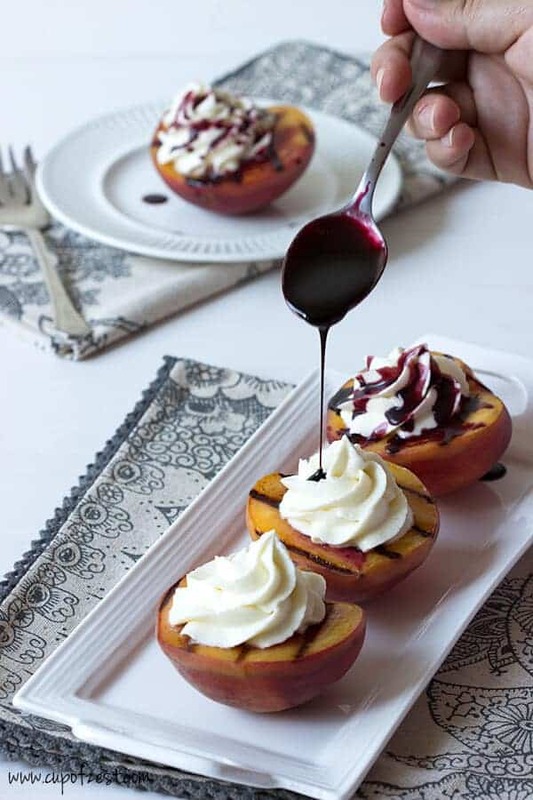 These Grilled Peaches with Mascarpone Cream and Port Reduction are ridiculously good and a great way to take advantage of those juicy summer peaches! So, grilled peaches with mascarpone cream are pretty good, but me being me, I had to add another component! I don’t know why I have this crazy desire to continuously add new components to my recipes, but I do. Like with my peach grapefruit sangria recipe, I could have just thrown all the ingredients into a pitcher, but I HAD to make a peach syrup……whatever……it took the recipe to a new level……just like the port reduction does in this recipe. I should just come to terms with my crazy recipe component adding ways since they tend to be great additions! Soooo, I made a super delicious port reduction for this recipe. The peaches were good with just the mascarpone cream, but that rich and sweet port reduction made it insanely good. This recipe is actually pretty simple to make even though it sounds all fancy and complicated. Throw some port into a pot and let it cook until it is reduced a bunch (just a little time consuming but not difficult), whip some mascarpone cheese with heavy cream and sugar, and grill some peaches. Then all that is left is assembly and you will look super fancy when you serve them to your friends or family. 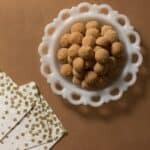 I ended up serving these to my friends at a dinner party that Stephen and I had in our tiny apartment (we ended up moving our fold out table into the living room between the couch and television so there was enough room for us to eat). My friends LOVED them and they actually went really well with the shrimp etouffee we had as a main course. They were eaten up so fast, and my friend Melissa even asked me to cater her life so I could make them for her all the time! She is too funny. Well, our dinner guests loved them, but you can totally make them for something more casual, like an afternoon bbq, and people will be asking you to make them all the time! 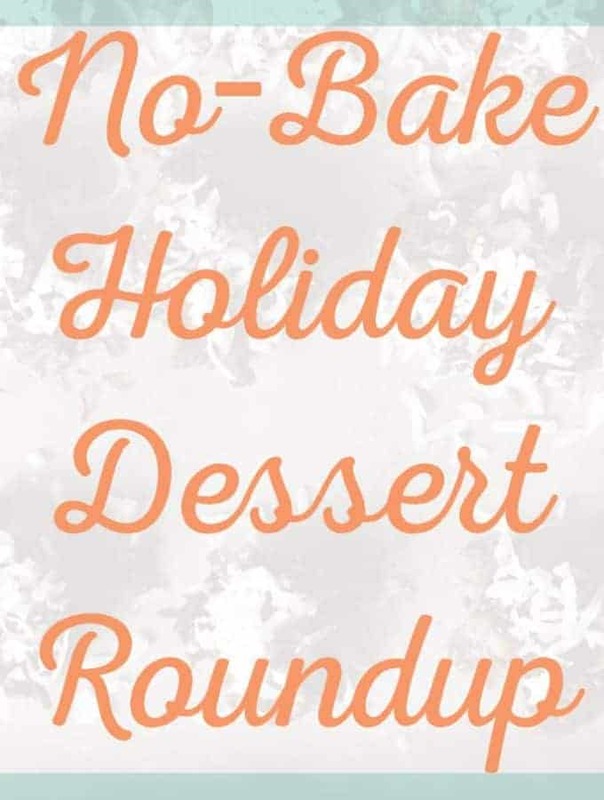 Let me know in the comments below when you make them! 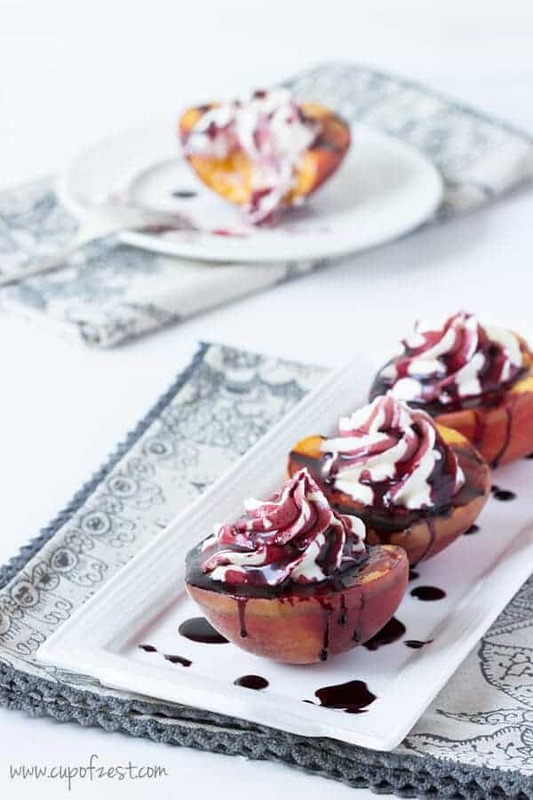 This grilled peaches with mascarpone cream recipe is topped with a super easy port reduction and is a great summer dessert option. 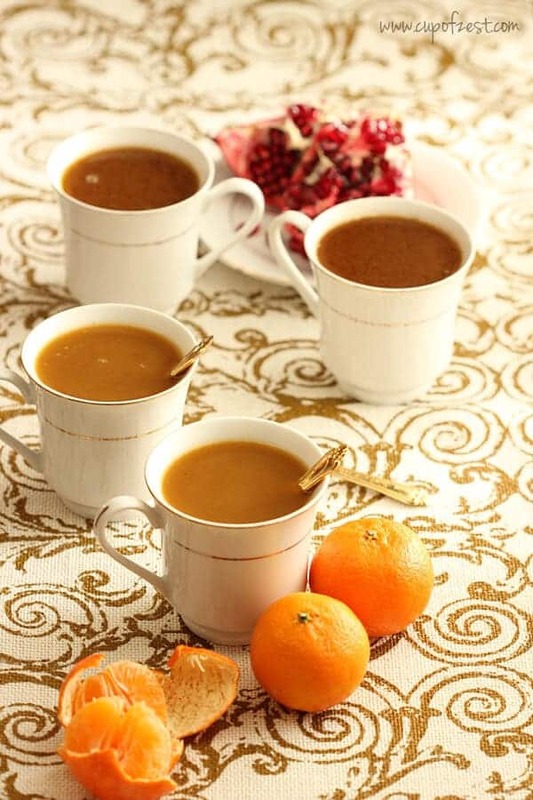 Place port in a small pot and bring to a boil over high heat. Reduce to a simmer and cook until you have 1/4 cup remaining, about 30 minutes. Place in the refrigerator to cool. 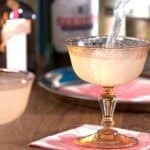 While port reduction is cooling, make the mascarpone cream. Using a stand mixer fitted with the whisk attachment, whisk the mascarpone cheese, sugar, vanilla extract, and salt on medium speed until well mixed, about 30 seconds. Reduce the speed of the mixer to low and slowly stream the whipping cream. Once all of it is added, scrape down the sides of the bowl, and return the mixer to medium speed. Whisk until firm peaks form, about 1 minute. Place the cream into the refrigerator. 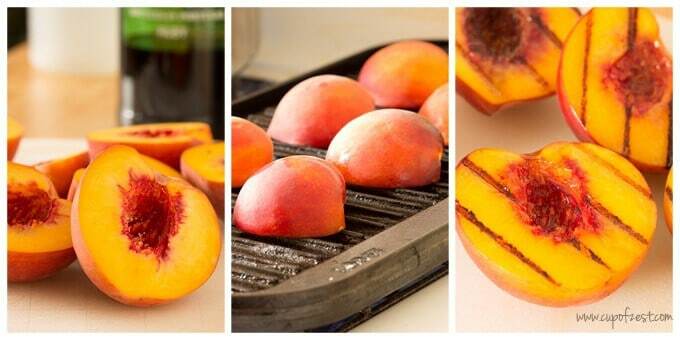 To grill the peaches, bring a grill pan or grill to medium-low heat. I you like, brush each peach half with the melted butter and place on the grill pan. Grill the peach halves until they are slightly softened and have dark grill marks, 6 to 8 minutes. 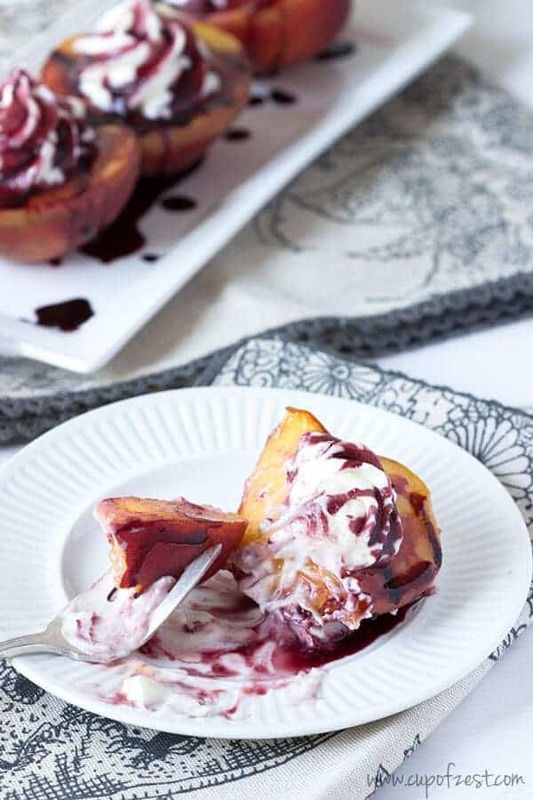 Allow the peaches to cool slightly, top the peaches with the mascarpone cream and drizzle with the port reduction. You can make the port reduction and the mascarpone cream ahead of time. Just let the port reduction come to room temp before using or else it will be too thick to pour. [br][br]Brushing the peaches with butter before grilling will keep the cut portion of the peaches from drying out (totally an aesthetic thing). [br][br]These are also great chilled! Feel free to grill the peaches, allow them to cool a bit, and then chill them before topping with the cream and port reduction. 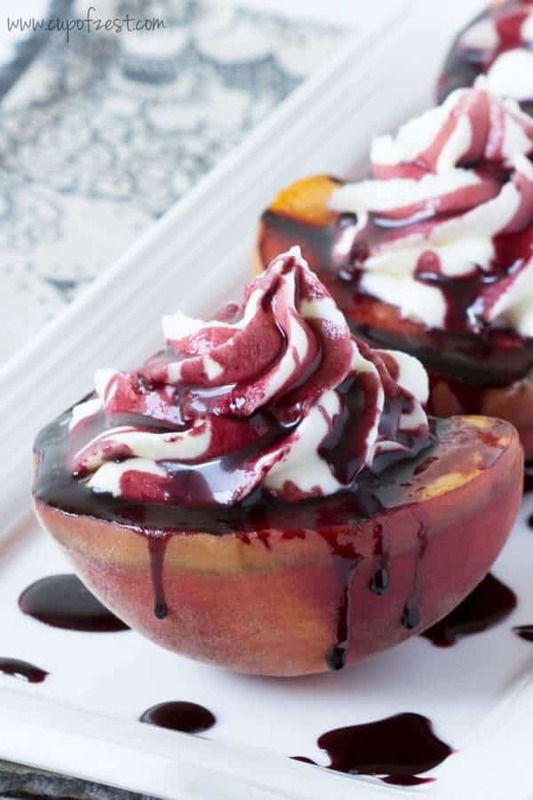 [br][br]Feel free to pipe the mascarpone cream onto your peaches if you want to make them look fancy! Oh My Goodness!!! Tried this last night and was so amazing!!!! 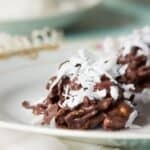 Such a fun and delicious recipe! 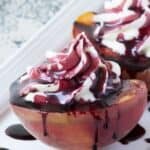 You already had me at grilled peaches but mascarpone cream and port reduction, oh my goodness, sounds almost too good to be true. Delicious! Seriously Nicole…these are sooo good! 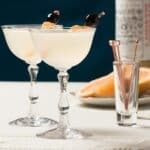 🙂 By the way, your poached pear recipe photo the other day is super beautiful! Oh my sounds too delicious!!! Love peaches…Cheryl. loved grilled peaches, can’t remember the last time i made some. definitely inspired to recreate the recipe tonight! This looks really good! It’s peach season in Ontario now so I should jump on it. Since port is sweet, I think subbing a Bordeaux or Merlot grape juice will work out fine for a halal version. Thanks! I’ve never reduced grape juice before, have you? I’d love to hear how it goes! these look amazing. that mascarpone cream looks great! SO GOOD! My boyfriend and I made six and ate ALL of them in one sitting. Embarrassingly delicious! Plus, it was much easier to make than I originally expected. Paired with a chilled Chardonnay–amazing! Thanks for the wine recommendation! Love mascarpone cream! These look fabulous. Totally gonna make them before the peaches disappear! Thanks so much Suzanne! Yup…get on those peaches now 🙂 I am having a difficult time even now finding some that are delicious. Oh my gawd!! These look amazing! Come make these for me pretty please?? I miss you!